Radiologic technologists use diagnostic imaging equipment to help physicians identify illnesses and injuries. 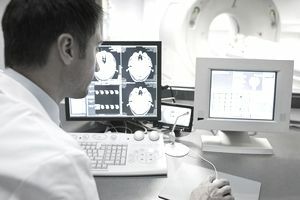 They might use x-ray equipment, computed tomography, magnetic resonance imaging, or mammography to perform X-rays, CT scans, MRIs, or mammograms. There were approximately 205,200 radiological technologists employed in 2016. The majority of them worked in hospitals, but many others worked in doctors' offices, medical and diagnostic laboratories, and outpatient facilities. Radiological technologists can specialize in one diagnostic imaging technology or in several. They're often referred to by a title that reflects the technology in which they specialize. For example, a radiologic technologist who specializes in computed tomography is usually called a CT Technician. Some job duties and responsibilities are common. Follow physicians' orders regarding the areas of the body of which images are needed. Follow procedures that prevent unnecessary exposure to radiation to themselves, as well as to the patient. Keep track of and organize patients' records. The highest paid radiologic technologists worked for the federal government in 2018, earning an average median salary in this particular sector of $65,230, about $31.36 an hour. This is more than the median salary for all radiologic technologists in general. You must complete a formal training program in radiography to work in this profession, and other education can be required as well. Education: Most people entering this occupation have earned an associate degree, but you can become a radiologic technologist with a certificate or a bachelor's degree. Earning an associate's degree generally takes about two years. Programs consist of a combination of classroom and clinical training. Radiography students take courses in pathology, anatomy, radiation physics and protection, image evaluation, and patient care. The educational requirements to become a radiologic technologist are comparable to the requirement to become a registered nurse. Licensure: Most states require licensure for radiologic technologists. You generally must have graduated from a program that has been accredited by the Joint Review Committee on Education in Radiologic Technology, and you'll probably have to take a written examination. You'll need soft skills to succeed in this occupation. Communication skills: You must be able to accurately and compassionately explain to patients what they're above to experience. You'll also have to be able to succinctly convey information to physicians and staff. Patience and empathy: Your patients are likely to be stressed, uncomfortable, frightened, and not on their best behavior. Physical stamina: You'll spend a good many hours on your feet, and might have to bodily assist patients in a number of circumstances. Mathematical ability: You should be detail-oriented, and should be good at science and math. The Bureau of Labor Statistics predicts that job growth for radiologic technologists will be faster than the average for all occupations from 2016 through 2026, at about 12%. This is due in part to aging Baby Boomers adding to an increase in certain conditions, such as Alzheimer's disease and cancer. Radiologic technologists are at risk for contracting illnesses from their patients, but no more so than other healthcare professionals. Exposure to radiation is another risk, but the protections that are in place, such as lead gloves and aprons, decrease its likelihood. Radiologic technologists are generally monitored for lifetime exposure by wearing registering badges during all working hours. Jobs in this field are usually full-time positions, but emergencies can happen around the clock. Those who are responsible for handling them must sometimes work odd hours, including weekends, evenings, and holidays. Those certified in more than one diagnostic imaging procedure will have the best opportunities. Having multiple certifications can increase your job prospects, as can graduating from an accredited program. You can use the Licensed Occupation Tool to learn about your state's licensing requirements. They can vary somewhat by state. What Is a Cardiovascular Technologist?